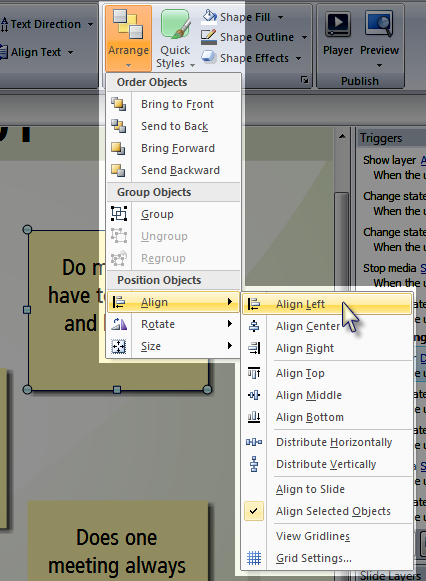 Storyline provides lots of tools to help you order, group, ungroup, resize, and position objects on your slide. Check out the following features. On the Home tab, click Arrange. 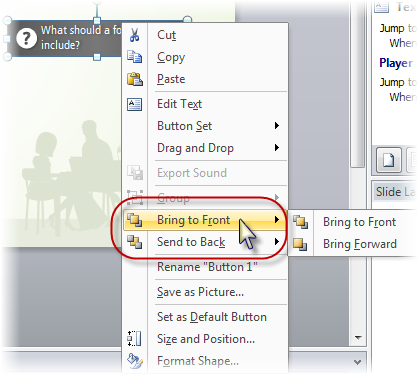 Then, select Bring to Font, Send to Back, Bring Forward, or Send Backward. Or, on the Format tab, use the Bring Forward or Send Backward options. Click the arrow next to either option to Bring to Front or Send to Back, respectively. Or, use the Timeline that appears below your slide. (If the Timeline tab isn't visible, click the Timeline, States, and Notes bar at the bottom to expand it.) All the elements on your slide will be listed in the timeline, in the same order in which they're layered on your slide. Topmost items are closest to the front, or top, layer of the slide. To change the layering order, just select an item on the timeline and drag it up or down in the list. 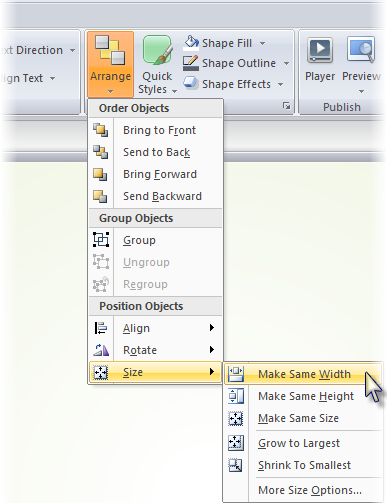 Or, right-click an object and choose Bring to Front or Send to Back. Grouping is a handy feature that allows you to move, resize, rotate, flip, or change other attributes of several objects all at the same time—as if they were a single object. To group items, you'll first need to select the items that you want to be grouped. You can do this with Shift-Click, Ctrl-Click, or by clicking and dragging a selection area around the items. On the Home tab, click Arrange and choose Group. Or, on the Format tab, Click the Group option and choose Group. Or, right-click the selected items and choose Group. On the Home tab, click Arrange and choose Ungroup. Or, on the Format tab, click Group and choose Ungroup. 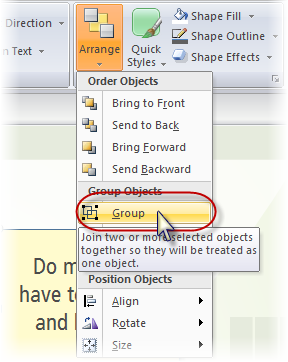 Or, right-click the grouped items and choose Group and then Ungroup. On the Home tab click Arrange and choose Regroup. Or, on the Format tab, click Group and choose Regroup. 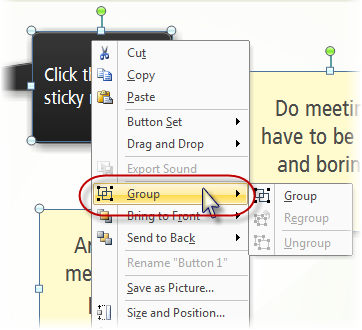 Or, right-click the selected item and choose Group and then Regroup. On the Home tab, click Arrange and choose Align. Or, on the Format tab, choose Align. Now choose one of the alignment options (left, center, right, top, middle, or bottom). Or, if you'd rather space the items evenly, you can instead choose Distribute Horizontally or Distribute Vertically. 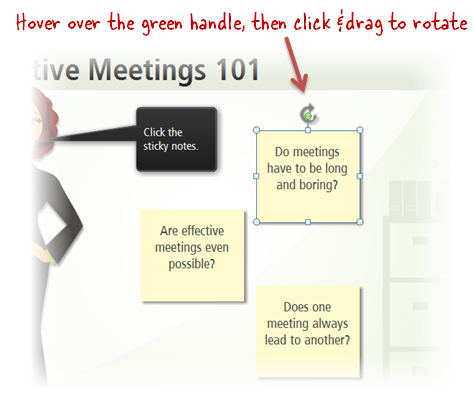 To rotate a selected item on your slide, you can hover over the green handle till it turns into a curved arrow, and then click and drag. Choose one of the options listed, or choose More Rotation Options to enter a specific rotation value. If you choose More Rotation Options, you'll see the following window. (Another way to get to this window is by selecting an object on your slide, right-clicking it, choosing Size and Position, and choosing the Size tab.) Enter a value in the Rotation field or use the arrows to increase or decrease the value. Click Close when you're done. To preserve the aspect ratio while resizing, hold down your Shift key while dragging a corner handle. To resize opposite sides of an object equally, hold down your Ctrl key while dragging a side handle. If you need more control over an object's exact size,you can select the object, click the Format tab, and enter your preferred values in the Height and Width fields. Select all the objects you want to re-size. On the Home tab, choose Arrange and then Size. Choose one of the options listed.